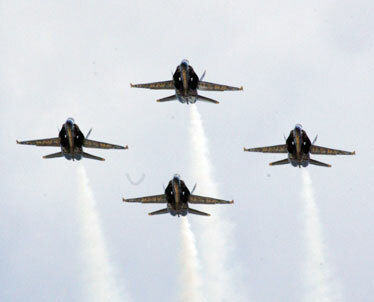 The Blue Angels arrived last weekend at Kaneohe Marine Corps Air Station for their air shows this weekend. Look out Oahu, but our skies will be a-buzz again with precision-flying military planes. Following last month's demonstration by the Air Force's Thunderbirds over Waikiki, here come the Navy's Blue Angels, as part of the 2007 Kaneohe Marine Corps-Navy Air Show, "the Blues on the Bay," this weekend. Because the flights are, according to a Marine Corps spokesman, "weather-dependent and show-driven," the Blue Angels should be the last act on the air show scheduled for Saturday and Sunday from 11 a.m. to 5 p.m.
"The Blues on the Bay" itself, including a carnival and food and drink booths, will start at 9 a.m. and end at 6 p.m. Admission to the Marine base, as well as parking, will be free to the general public, and special seating can be purchased on the Ticketmaster Web site at www.ticketmaster.com/promo/vso8hq. Pilots Cmdr. Kevin Mannix, left, Lt. Cmdr. Tom Winkler, Lt. Cmdr. Anthony Walley and Maj. Clint Harris are eager to fly. Roberts Hawaii is offering a special weekend tour of the Pacific Aviation Museum on Ford Island that includes a dropoff at the base for the air show. The tour, starting at 8 a.m. Saturday and Sunday, includes roundtrip transfer from the Waikiki Trade Center on Seaside Ave. to the museum, that includes general admission. Special shuttles will also be operating all day Saturday and Sunday between the museum and the base that can be ridden for a nominal fee. For more information, call 441-1000 or visit pacificaviationmuseum.org.